What do the world’s richest people spend their money on? Alas, not all of them have taste, but those who do often enjoy sharing the thrill of the finer things. Designer clothes and jewelry are one way to do it, but you’ll only really get to show them off if you’re a social butterfly. A luxurious home is another, but only a limited number of people will ever see it. A luxury car, however, makes a real statement. It’s something everybody will notice when you drive down the street. Your friends will love to ride in it and it can even make the lives of passers-by a little brighter. It’s been around for 93 years, but the Rolls-Royce Phantom still took pride of place at last year’s Dubai International Motor Show, and for very good reason. The number one choice for the world’s most powerful people, it’s a car that means business, and it’s now lighter, quieter and more elegant than ever before. The all-new aluminum version, fitted with sleek platinum plating, has a 414kW engine, 2kg of foam and felt concealed within the interior to absorb sound, 6mm thick doubled glazed windows and a fantastic suite of sensors and driver assistance tools. A windscreen-mounted camera watches the road ahead while integrated feedback circuits ensure optimum performance. Mercedes has long been a byword for luxury and the Maybach S Class takes it to the max. With an interior of sculpted wood upholstered in the finest leather, it provides the ultimate in comfort. A sophisticated intelligent assistance system provides relief from the stress of driving, ensure that you brake safely in emergencies and can even park the vehicle for you, as well as tracking important information like tire pressures and fuel levels, and checking ahead with satellite assistance to establish the best routes through traffic. It also has an optional personal assistant which can book your theater tickets and find you a table at the best nearby restaurants while you’re en route. If you want a high performance, muscular machine that still delivers when it comes to luxury, the Ferrari California T is a fantastic choice. With a turbocharged engine that goes from zero to 60 in 3.6 seconds, it boasts a distinctive, sleek design and is perfect for driving with the top down on a sunny day. An innovative steering box makes driving a breeze and body motion accelerometers help to keep the ride smooth no matter how fast you go. State of the art electronic systems add to the quality of the suspension and ensure fast but smooth braking. Seven forward gears provide additional precision control and there’s even a special compartment to keep your golf clubs in. 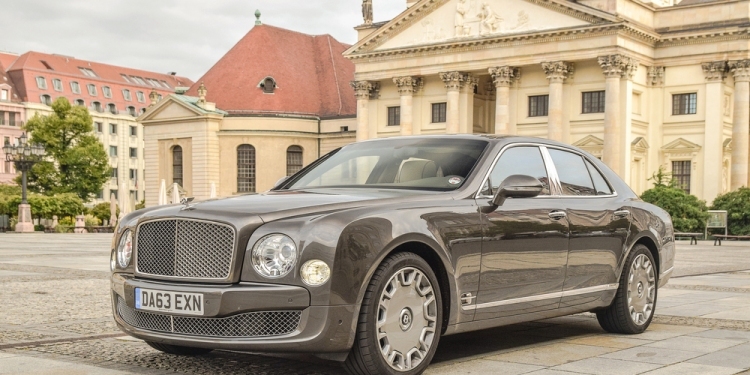 An elegant British car with classic appeal, the Bentley Mulsanne is the kind of vehicle James Bond would drive on his day off. It’s wonderfully customizable, with 25 different shades of leather you can choose from for the interior, plus 22 different carpet choices. Everything here is focused on comfort, with soft, easily adjusted seats and airplane-style fold-down trays so back seat passengers can comfortably use their laptops. Each seat has its own air conditioning controls and in the back there’s a fridge to cool your champagne, with complementary hand-cut champagne flutes. There’s an extended wheelbase option available for those who want additional legroom. For a real race car experience with the comfort of a classic luxury vehicle, the Lamborghini Veneno Spyder is hard to beat. Its beautiful aerodynamic design is complemented by a powerful 12-cylinder engine and an interior insulated with a lightweight carbon fiber weave that adds to its efficiency while giving it a soft and luxurious feel. It looks like a spaceship and the fully independent suspension will make you feel like you’re flying, especially if you have somewhere you can take it to its top speed of 355km/h, and a carbon/ceramic braking system keeps you in control. The roof rolls back for top-down driving because this a car that deserves its day in the sun. Of course, for many of us these cars are, financial speaking, way out of reach but it doesn’t hurt to dream big. Who knows, perhaps if you sift through a compilation of lottery strategies you may find yourself winning enough money to buy two! Like great art though, these cars are a delight whether you can afford to drive them or not – and there’s nothing to stop you from dreaming.